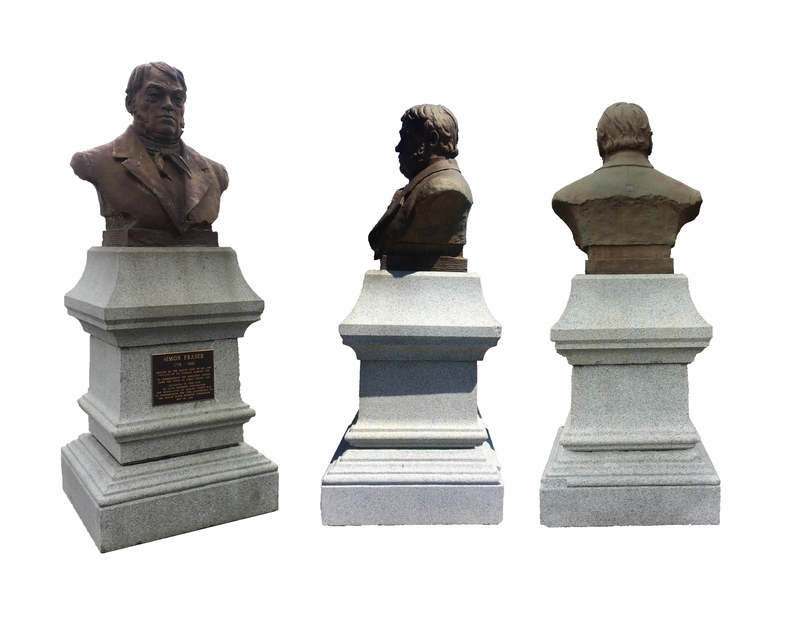 In 2017 New Westminster City Council’s Heritage Commission, Public Art Committee and General Council Meeting each approved a proposal in which I requested permission to remove a six-inch section of the Simon Fraser Monument’s granite pedestal. I proposed that this section of granite would be relocated to a small pond, in a remote mountain pass in the Canadian Rockies, where the Fraser River rises. I identified this action as a comparatively subtle act constituting a further ‘lowering’ of the monument, and an extension of a process of removal, reduction and relocation that has accompanied the monument’s history. A condition of the approval by city council was the requirement to attain written support from a specific First Nation community in New Westminster and the nation whose tribal boundaries the granite would be repositioned within. The process that followed has revealed some of the structural complexities, ideological aspirations and practical uncertainties located in achieving such a request. In addition, it has highlighted the vulnerabilities and problematics of working at distance to the place in which the project is located geographically and conceptually, and the ability to maintain institutional attention on a durational project. As an ongoing and emergent project, Lowering Simon Fraser has reiterated the tensions between determinative and contingent qualities that are a consistent feature of my practice. Recently I rearranged the project to leave the monument intact, for the moment. A new question now sits at the center of Lowering Simon Fraser and has helped shape a different conceptual route that asks: Should Simon Fraser be lowered? The project is re-routed towards a temporary sculptural assemblage, briefly inhabiting the site of the monument and operating in parallel to a public meeting held to debate this question. This project is currently developing as part of an extended residency with Contemporary Art Gallery (CAG) in Vancouver, Canada. It will be physically located in New Westminster, one of 21 municipalities within Metro Vancouver, about 30 minutes by Skytrain from downtown. From 1858-66 New Westminster was established as the first capital of British Columbia and gained its nickname as ‘The Royal City’. The Fraser River, the longest river in British Columbia, forms the city’s waterfront. 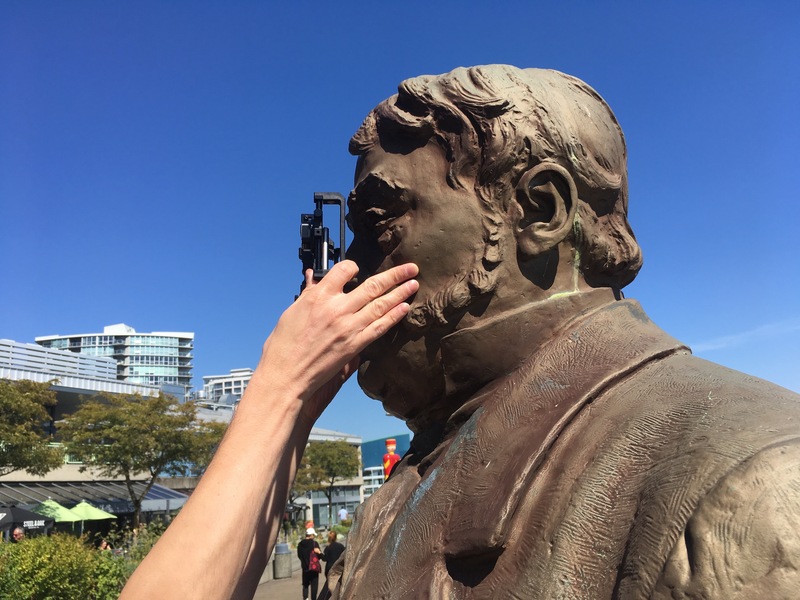 Conceptually, the project is anchored to a granite and bronze monument in memory of fur trader and ‘explorer’ Simon Fraser who is credited with ‘discovering’ and traversing the river on a commissioned expedition for the North West Company to locate an effective trade route to the Pacific Ocean. The river has other names in First Nation languages, the most visible of those names being Sto:lo. In the early years of the 20th century the New Westminster branch of the Native Sons of BC (a pro-settler fraternal society) commissioned the Simon Fraser Monument. This object has an intriguing history of disassembly, reassembly and relocation. In 1908 a tall granite column was unveiled at the top of Albert Crescent Park overlooking the Fraser River; In 1911 a bronze bust of Simon Fraser was commissioned and from celebrated Canadian sculptor Louis-Phillipe Hébert and positioned on top of the column. Over the next decades the monument underwent several relocations that moved it steadily downhill towards the river. By the early 1980s the monument sat in isolation on a large traffic island and was noted to have fallen into a state of disrepair. In 1986 (Vancouver’s Expo year), the suburban city of New Westminster launched it’s ‘revitalised’ river frontage and property developers sponsored the relocation of the monument to Westminster Quay. In 1988 the monument was rededicated, the granite plinth had been substantially reduced in height and the bust turned 180 degrees to face away from the river, its gaze now directed towards the Paddlewheeler Pub & Grill and La Perla Ballroom. Hanging baskets of pink and purple petunias add a bright spot in the background for tourists taking quick selfies with the monument. It is this curious history that constitutes a series of unintentional ‘lowerings’ referred to in the project’s title. In 2018 it is somewhat unclear who owns or takes responsibility for the Simon Fraser Monument, its upkeep and its continued presence in the city. Now located at a riverfront site, I am interested in the monument’s relative level of invisibility in the public consciousness. Written historical accounts, official texts and indigenous oral histories depict very different versions of Fraser’s navigation of the river. Fraser himself died a disappointed man, in relative poverty, having mistaken this major waterway to be the Columbia River. The potential for ongoing friction within these perceptions has been an impetus for the development of this project. Archival research has located many images of the Simon Fraser Monument at its various locations in Albert Crescent Park. There are also references to a transformer stone called Sxwoymelh (another form of monument) at the park site. This large stone was destroyed for the construction of the New Westminster Rail Bridge in 1902. The appearance of the granite plinth for the Simon Fraser Monument in 1908, very close to the site of Sxwoymelh, troubles the monument’s official history even further. 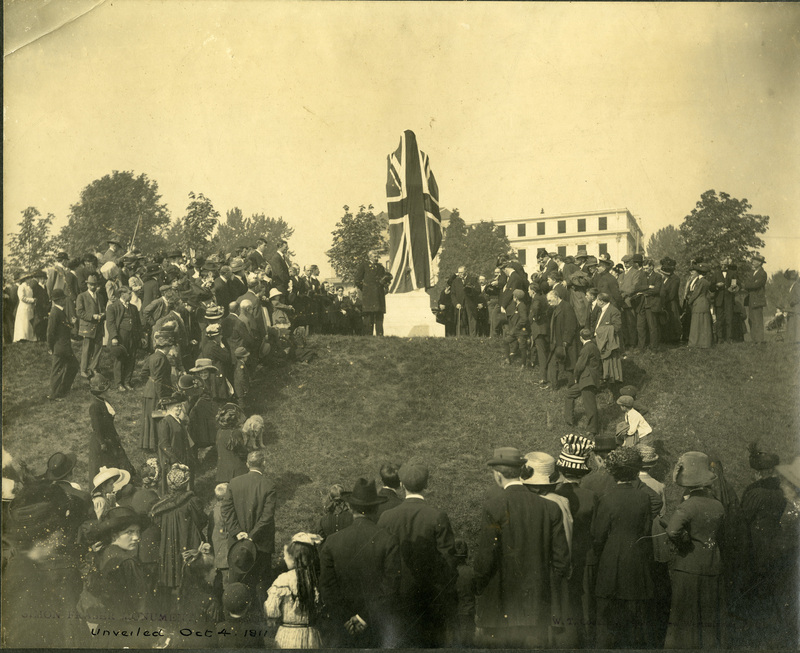 Unveiling the bronze bust for the Simon Fraser Monument, New Westminster, 1911. Image courtesy of New Westminster Archives. Lowering Simon Fraser has been tethered to a conceptual system of proposed action (something is going to happen) and the open-ended work (responsive to external situations that alter the course of the art work). It develops the idea of ‘functional absence’ as a productive force that can extend the comprehension of a public monument as a ‘live’ or contingent object’ and as a method to intervene in established histories and narratives. What is the role of narrative, imagination and visualisation in the dissemination of knowledge around a public art work? How can an alternate politics be released in relation to physical objects, historic events or sites of memorialisation? How can a time-limited public artwork negotiate problematics of exclusivity, invisibility and ideas of civic responsibility? Transformer stones feature in Sto:lo oral histories as geographic features where ancestors were transformed into stone for their wrongdoing. These sites are considered to contain living spirits who have been halted, or frozen, in stone and stand as important cautionary tales for those who encounter them.